Lately I have felt a little blue. Maybe due to summer and less interaction with people at schools and MOPS or the fact that my kids are trying to kill or tattle on one another... I don't know. When I had some big dental surgery yesterday and my hubby couldn't come get me as the kids/baby had just fallen to sleep... A dear friend drove in from Simi, 20+ minutes away to pick me up and take me home... Awww fuzzies like that are priceless! After dragging my kids on a walk our dog escaped and ran away, our neighbor called and rushed to our rescue. 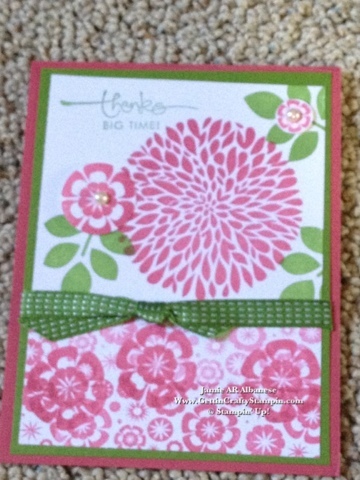 Thennnn in today's mail, there was this sweet card... A real pick me up from my dear friend and upline Susie Reno! With our newest In-Colors of Gumball Green and Primrose Petals she really brightened my day! 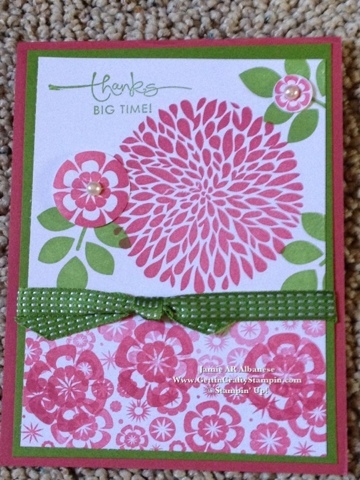 With our Adhesive Pearls and this new stamp set Betsy's Blossoms this is a fun, quick and easy card that blessed me to noooo end! So, feeling blue or alone?? Don't be surprised when you are blessed with friends and unexpected blessings showered down on you! Feel special and share the love, send someone in yourrrr life a fun card!